If you are using the messaging app on your smartphone then you probably are using stickers and emojis as well when communicating with your loved ones. Because using constantly the same stickers can become quite boring, now with the right tool on your smartphone you can create your own personalized stickers. To help you with the search, we looked and discovered a great app for creating personalized WhatsApp stickers. Let’s see what the WhatsStickers app offers you. WhatsStickers is a sticker app which is easy to use and very fun, offering WhatsApp users a chance to create their own custom WhatsApp stickers and use their own photos and names to create them. Developed for Android users, with this app you can create personalized stickers for WhatsApp with custom fonts, colors, and shapes offered by the app and all that in 4 simple steps, choose the image, erase the background, add the text and save your sticker. Create the perfect stickers that match your taste. WhatsStickers offers different features for WhatsApp users to easily create amazing personalized stickers and save them. On the app, you can use custom fonts, shapes and colors choose the name and the photos for your stickers. 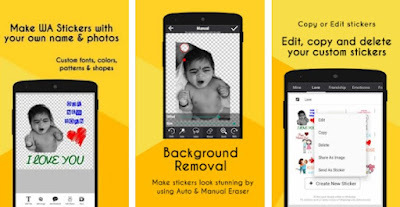 The stickers you created can be edited, copied and deleted depending on your preferences. Offering you 50+ fonts to choose from available in multiple languages, with this app you can even search and download images from 100+ clipart categories offered. Also, by using this app, each user can find the editable sticker packs so he can add his name to already existing stickers as well. The huge selection of clipart, emoticons, and packs available will gives the user a lot of choices and the text color, size, stroke, shadow, and curving can be adjusted by choice. On the app are offered multiple shapes like circle, arc, and polygon and the user can also erase the background of images, auto, and manual, crop and blur images as he likes to. Download this app on Google Play for free now to create your own personalized WhatsApp stickers!